Simple Wedding Cakes that are Elegant and Delicious! So you ask yourself, what is a simple cake? Is it a round single tier creation, a five tier bridal design that is minimally decorated or, is a simple cake one that you or a friend created just for your special day? A simple cake can be all of the above but just because it's simple, doesn't mean that it isn't beautiful or elegant. Your bridal creation can be decorated with your color pallet or it can be a traditional white cake with some of the same flowers that you will be carrying in your bouquet. Butter cream, whipped cream or fondant icing? Butter cream has ideal consistency and is perfect for spreading and decorating a bridal cake or any dessert for that matter. Butter cream frosting is desirable because it is rich in flavor and can be used to make flowers and other cake embellishments. Butter cream holds up better in the heat than whipped cream which has a tendency to flop. Some say butter cream is a little too sweet for them and they prefer whipped cream to frost their cakes. Whipped Cream has a decadent taste and texture but it liquefies faster than butter cream. Whipped cream doesn't stay fresh as long as butter cream and will fall if exposed to the heat of the summer. 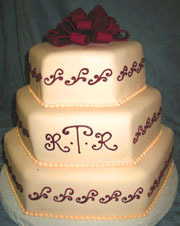 Fondant frosting is popular on many television reality shows. It is easier to be creative with fondant frosting than butter cream icing and whipped cream frosting. 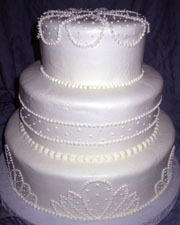 This all white, three tiered cake is decorated with little beads resembling pearls to form its elegant pattern. A simple cake does not have to be boring, it can be designed with fresh or silk flowers, fountains, stairways, editable pearls, ribbons, a monogrammed topper or a replica of a bride and groom. As you know, the price of a cake is not in the cost of the ingredients but the price depends upon how long it will take a baker to prepare your special creation. Don't forget, your cake is not just a dessert, it is a centerpiece for your reception and the pictures of you and your husband cutting the cake will last your lifetime. You want a cake that is simply beautiful, timeless and tasty. The above is a simple three tiered, pentagon shape with little beads separating each decorated layer. The topper is a red bow made from fondant. This stylish three tiered cake has a ribbon separating each layer with a simple flower adorning the top and side of the cake. So simple and exquisite! 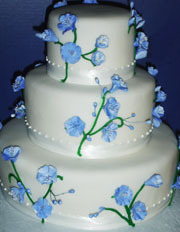 For the bride who loves edible flowers, this cake says it all. It's simple and very classy. 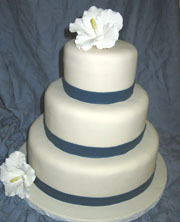 This is just a sample of simple wedding cakes that pieceocakenj.com can create for you. 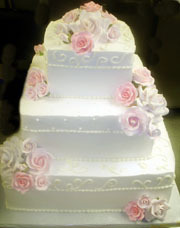 Let your imagination run wild and design a delicious cake of your dreams!!! Now that you've figured out your cake design, let's explore other planning ideas.